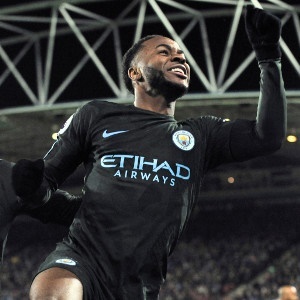 Huddersfield - Raheem Sterling grabbed a late winner for the second time in six days as Manchester City came from a goal down to beat Huddersfield 2-1 and secure a club-record equalling 11th straight league win. Sterling's dramatic intervention meant Pep Guardiola's table-topping side were able to reestablish an eight-point lead over second placed Manchester United in the Premier League title race. United had briefly closed the gap with a win against Brighton on Saturday. Huddersfield absorbed a barrage of pressure to go in front in first-half stoppage time at the John Smith's Stadium as Nicolas Otamendi diverted Tom Ince's corner into his own net. City equalised less than two minutes after half-time as Sergio Aguero converted a penalty awarded for a foul on Sterling by Scott Malone. Sterling, who scored the 88th-minute winner as City beat Feyenoord 1-0 in the Champions League on Tuesday, then bundled in a fortunate goal with six minutes left. As tempers boiled over following Sterling's winner, Huddersfield winger Rajiv van La Parra was sent off at the final whistle for a shove on Leroy Sane. Huddersfield, looking to respond to a 4-0 thumping at Bournemouth eight days earlier, showed great discipline as they sat back and frustrated City for long periods. City had more than three-quarters of the first-half possession, but struggled to create clear chances before the home side shocked them seconds before the interval. Vincent Kompany headed well wide under pressure following a corner from Kevin De Bruyne, who then took a quick free-kick that Aguero swept into the net from an offside position, with the goal disallowed correctly. Aguero just failed to connect with a low Sane cross that whizzed across goal, and the Argentina international was only denied by an outstanding tackle from Christopher Schindler after De Bruyne and David Silva combined to play him clear on goal. City's best first-half opening came six minutes before the interval. Aguero was played in by Silva's flick, and his angled drive was beaten away by keeper Jonas Lossl. Sterling looked certain to blast in the rebound, but somehow blazed wide from eight yards. Huddersfield, having survived that, then caused a major surprise as they went in front in first-half stoppage time. Ince delivered a near-post corner that Schindler flicked on at the near post, with the ball diverted in off Otamendi's shoulder. City, though, were awarded a penalty just 55 seconds after the restart, as Malone dragged down Sterling. Aguero sent Lossl the wrong way from the spot to score his 11th goal of the season for his club. That was the signal for City to increase the pressure on the home side, with Lossl pushing the ball aside after Aguero had been played in by Fernandinho. Sane then struck a dipping free-kick against the bar following a foul by Jonathan Hogg on Silva. The visitors continued to enjoy virtually all of the possession after that. It became an increasingly bad-tempered contest, though, with Fernandinho booked for an outrageous dive, team-mate De Bruyne perhaps fortunate to escape a yellow card for a body check on Van La Parra, and Huddersfield head coach David Wagner spoken to twice by referee Craig Pawson. City looked as if they would go in front when De Bruyne fed a perfectly weighted through pass to Silva, but the Spain playmaker was forced wide and delivered a tame cross straight to Lossl. But the pressure finally told as City got the lucky break their superiority deserved with six minutes left. De Bruyne's through pass played in substitute Gabriel Jesus, and when Lossl made the save, the loose ball looped into the net off Sterling's thigh. Huddersfield might still have equalised late on as Aaron Mooy's free-kick brushed the side-netting. But victory took Guardiola's side another step closer to a league title that already looks theirs for the taking.